A mighty magician has touched London with his wand. The spirit of altruism has descended upon the City of Self. The note of preparation for the great festival of the Christian Church, which was sounded early in November when the windows of the stationers, the booksellers’ shops, and the railway stalls became suddenly gay with the coloured plates of Christmas numbers innumerable, has increased in volume as time went on. Now, on the eve of the great day, there is not a street in the capital containing a shop, from its broadest thoroughfare to its narrowest by-way, that has not decked its windows for the Christmas market. The meat markets speak of good cheer in the substantial prose of the Briton’s national beef; the poultry markets strike a more romantic note with the turkeys and the geese that lift the Christmas dinner above the Sunday level, but it is at Covent Garden that the true poetic atmosphere prevails. 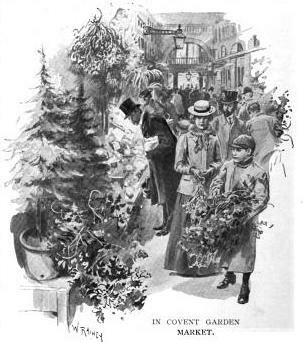 There not only does the yellow glow of the orange give colour to the foggy arcades and the dimly-lighted central avenue, but the holly and the mistletoe piled high in every direction speak to our hearts of the Christmas that Charles Dickens entwined with the love and sympathy of family reunion. The scarlet berry and the white gleam out from the masses of green, the fir-trees spread inviting branches that suggest a hundred delights, and the most jaded citizen, passing through Covent Garden on the eve of the great festival, sees the shadows of life lifted in the glow of the yule log, and amid the roar of the traffic and the hoarse cries of the street hawkers hears the merry laughter of little children happy in their English homes. In the busy streets the market is at its height. The grocers are so gay with good things that grown-up men and women stop in front of them as fascinated as were Hansel and Gretel by the witch’s cottage made to eat. The sweetmeat shops are so cunningly set out that even the aged dyspeptic feels his loose change burning a hole in his pocket. 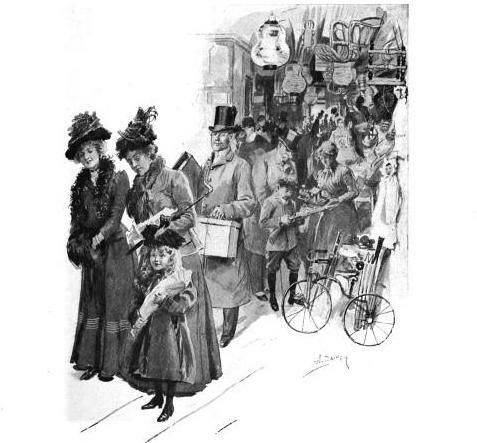 The stationers’ shops are packed from morning till night with men, women, and children who are purchasing pictorial Christmas greetings that will tax the capacity of his Majesty’s post office almost to the point of the last straw. “Post early,” the Postmaster cries beseechingly for weeks before the festival, and the great public obeys. From the twentieth of December it begins to crowd into the post offices with hands full of envelopes and arms full of parcels, and the post office assistants, male and female, seem to become machines. They sacrifice themselves nobly to a grand cause. The flower girl has cried aloud in her weariness that she “hates the smell of the roses,” but the loyal army that serves under the banner of the Postmaster General has not yet given us one weakling to cry aloud that he (or she) hates Christmas. Presently the bustle and the tumult, the crowding and confusion, are over, the streets that all through Christmas Eve have been like fairs grow gradually darker as the flickering lights go down and the shutters go up. Thousands of men and women who earn their living in London have crowded the railway termini, and gone to their friends in the far-away towns. Londoners themselves have always the home feeling strongly upon them on Christmas Eve. It is a night to spend with the wife and bairns in happy, eager anticipation of the morrow. So the theatres are mostly closed, the music-halls are half empty, and even the street market grows deserted towards ten o’clock. Midnight finds the great thoroughfares given up to the policemen and a few stragglers. The great home festival has commenced. All London is under its own rooftree waiting for Santa Claus. But long before Christmas Eve has melted into Christmas Day mighty London has had mighty deeds to accomplish, that there may be no hitch in the preparations for the Gargantuan feast. The great railway carriers have been at their wits’ ends to deliver the parcels, the packages, the hampers, the cases of gifts and good things that have been entrusted to them. On hundreds of hampers the word “Perishable ” stares the officials in the face. But trains are late owing to the increase of the goods and passenger traffic. And the “perishable” hampers arrive in such vast quantities that horses and men have to be kept at work night and day in order to deliver them. Sometimes it happens—it cannot be helped—that the longexpected poultry or game from the country that was to have been the Christmas fare is delivered to the disappointed householder just as the family are sitting down to something else purchased in despair at the last moment. The theatres are mostly closed on Christmas Eve, but do not imagine that they are deserted. 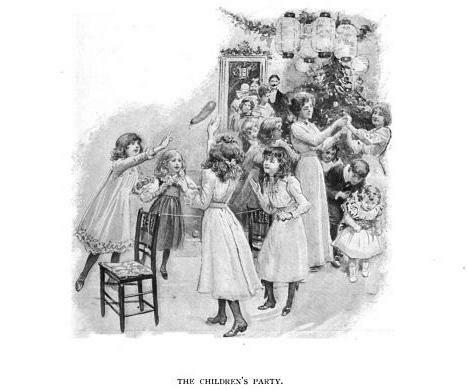 In some of them the preparations for the gorgeous Christmas pantomime which is to delight the children, young and old, on Boxing Day are in full swing. It is the dress rehearsal. We pass the public-houses which are still open, but which are not thronged as usual. Here and there we come upon men carefully carrying the goose that they have secured in the goose club, and others who are carrying home the hamper of spirits and wine that Boniface has presented them with in return for their weekly subscription. But there is little noise, and there is a marked absence of the old riotous excess. London at Christmas time to – day is a great improvement London of the past. Time creeps on, and the quiet hours have come. Now and again the old tunes float out on the silence of the night. “The Mistletoe Bough” is rendered more melancholy than even the composer intended it on the Christmas remain with us to sfng the old world words that bear us back to the days of the yule log, the masquers, the mummers, the squire, the stage coach, and the snow-clad earth of the Christmas of our forefathers. It is Christmas morning. London does not rise so early as usual to-day, and it is well on towards ten o’clock before there is any considerable movement. Then people, who are going to spend the day with friends in the suburbs or at some little distance, begin to make their way to the railway stations. Here are youths and maidens hasteni ng by themselves, here an aged man and woman making their way slowly, here are family parties, papa, mamma, and olive branches innumerable. Almost without exception each bears a brownpaper parcel. It is the Christmas gift, the little present that is usually taken to the hosts by the visitors—to uncle John, to aunt Mary, to the cousins, to grandmamma and grandpapa. All the morning long the little stream of parcel bearers going out to spend the day with relatives and friends continues, but towards eleven it is joined by another crowd, a crowd that carries a church service instead to be by a cornet with a cold. The waits of a paper parcel, a crowd that is spending have had their day, but still in some parts of London they wake the sleeper from his pleasant dreams, and call for a Christmasbox in the morning. And the carollers still Christmas in its own homes. The church bells are ringing merrily. When they cease there is a noticeable thinning of the stream of pedestrians. The trains on the local lines have ceased running until after Divine service, and now there are only the travellers who are taking ‘bus and tram and cab to their destinations. The private carriages, the hired broughams, will not start with the little family parties outward bound until later in the day. Up till half-past one there are always people in the streets taking the Christmas walk which is to prepare the appetite for dinner, a lengthy meal that taxes the digestive powers of most of us, and the parks and open spaces are fairly filled if the weather is fine. But after half-past one quiet reigns once more. London is indoors again. The richer folk are at lunch—the poorer folk are at dinner. This is the hour to walk abroad observently and take an unobtrusive peep at the windows as you pass. Everywhere you see that it is Christmas Day. At many a window you can see the little ones happy with the gifts that Santa Claus has brought them. Little boys are already testing the strength of their playthings. Little girls are enjoying the first sweets of motherhood in their tender attentions to the new doll. The studious children and the romantic children are absorbed in the pages of the new story books. Over the children’s heads at the windows you have a glimpse of the table spread and waiting for the feast that is being dished up in the regions below. The fire light flickers and dances on the walls, and catches the bunch of holly over the mantelpiece and the evergreens twined in the gasalier. And up through the area railings there comes a fragrant odour that makes you look at your watch and remember your own luncheon hour. 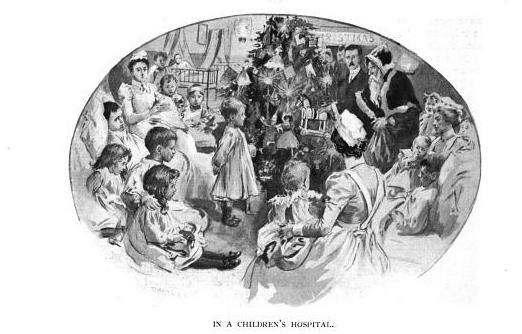 From one to half-past there is a little stream of visitors to the workhouses and certain charitable institutions, where Christmas is being celebrated by a dinner to the inmates. Fashionable philanthropy which has contributed to the good cheer passes a pleasant half-hour on Christmas Day in assisting the poor, the lonely, and the afflicted to share in the common joy. Even in the great palaces of pain, where suffering is ever present and death rarely absent, the doctors, the nurses, and the students do their best to bring a little of the world’s happiness to the bedside of the patient. For the children there are toys and Christmas trees, for the grownup folk such fare and amusement as they can appreciate. There are people, of course, who have nothing on Christmas Day, but they are few. Some by nature of their work have to make shift and take their Christmas dinner where they can. The ‘bus driver may have to take his in the ‘bus, but in his way he manages to make up a little family party. His wife brings the meat and the pudding in two basins, and she and his little daughter sit with him in the ‘bus, and make it homelike. The conductor who is unmarried is invited to take a seat at the “table.” Appreciating the kindly thought he goes into the public-house, fetches the beer, and pays for it. The crossing-sweeper goes off duty after the folk have returned from church, and does not come on again till evening. He generally has a “home,” and his table, if it does not actually “groan,” is well covered with good things. For the charitable ladies of the neighbourhood have always a corner in their hearts for the crossing-sweeper, and many are the gifts he gets in the shape of creature comforts for his Christmas entertainment. About four o’clock the Christmas dinners of the well-to-do begin. 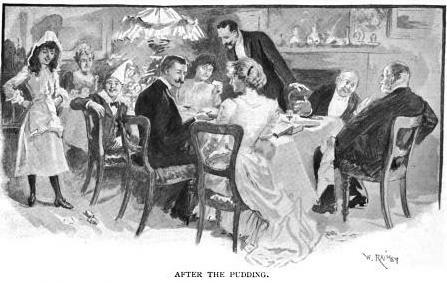 Except among the aristocracy it is a usual thing to make the dinner hour afternoon instead of evening. From four to seven you may picture family parties in almost every house you pass in the best neighbourhoods. The lamps of the street are just lighted, and darkness is setting in. The blinds of the houses are drawn, but behind them you know that a united family are gathered round the board, and that merriment is the dominant note. From seven o’clock the sounds of festival strike your ears. You can hear the bang of the Christmas cracker, the merry laughter of the children, at times the sounds of an unmistakable romp. All over London the same spirit is present. Young and old have given themselves up to the joy of living. Later on music asserts itself. The streets and the squares are so quiet, there is so little traffic, that the slightest sound in the houses is heard by the passers by. The music that you hear is rarely of the convivial order until the parting hour comes. Up to this time sentiment seems to be more in favour both with vocalist and instrumentalist. Even the concertina, which makes its appearance in the streets with home-returning youth, is not music-hally on Christmas night. There is a restraint and a sobriety about Christmas Day which always keep it a Church festival. There is a deeply rooted idea that although it is not a real Sunday it is a Sunday with quiet games allowed. Soon after ten o’clock the home-returning travellers begin to appear in the streets. Once more the wayfarers are almost without exception parcel-laden. They are bearing back the gifts that have been presented to them in return for their own. Through the front door you occasionally catch a glimpse of the good-bye. There is considerable embracing among the ladies. The men shake hands with a hearty grip that has the sentiment of the season in it. The old four-wheel cabman sits noddintr on his box. But even he revives under the influence of the proffered glass of grog, and wheezes out “the compliments of the season” between two coughs. Soon after eleven o’clock the cats have the roadway to themselves. They dart from area to area undisturbed. Even the dogs seem to be keeping Christmas indoors. Midnight strikes. You hear it in the silence of Christmas night as you hear it at no other time. The great day has come to an end. If you are abroad you will be startled by your own solitude. You will understand how truly is Christmas the festival of the home. A man or a woman alone kindles a feeling of sympathy in your breast; you begin to think a tragedy of friendlessness around them. You pass the cab-stand. It is empty. You pass the public-house. It is shut. The ‘busses have ceased running. You quicken your steps, and hasten to your own home, which you have only quitted because you want to see what London looks like on Christmas night. As you pass the policeman you involuntarily say, “Merry Christmas to you.” The policeman answers, “Same to you, sir.” Perhaps you put your hand in your pocket. It is past midnight, and Boxing Day has dawned. Thankyou for this article; I love the illustrations too.